ACR’s mission is to protect and maximize investor purchasing power. Focused on preserving capital during periods of economic decline. Pursuing above-average, long-term absolute and relative returns. Welcome to the ACR International Quality Return Fund (the “Fund”). The Fund’s inception was December 30, 2016. The Fund’s advisor is ACR Alpine Capital Research, LLC (“ACR Alpine Capital Research”, “ACR” or the “Advisor”). Investors should consider the investment objectives, risks, charges and expenses carefully before investing. For a prospectus with this and other information about the Fund, please contact us at (855) 955-9552 and/or click here. Read the prospectus carefully before investing. Investments in the Fund involve substantial risk. The Fund is not suitable for investors who cannot bear the risk of loss of all or part of their investment. The IQR Fund is distributed by IMST Distributors, LLC. 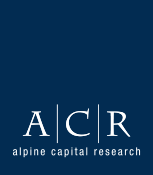 ACR Alpine Capital Research is a fundamental valuation based asset management firm. Our investment philosophy is rooted in principles essential for successfully evaluating fundamental value and risk, which we believe is the key to investment success. ACR Alpine Capital Research, LLC is a registered investment advisor. Copyright © 2017 ACR ALPINE CAPITAL RESEARCH, LLC. All Rights Reserved.